Experience what Egypt has to offer with our breathtaking 2-day trips to Cairo and Luxor from Hurghada to visit the most famous archaeological sites in Cairo and Luxor joining an expert tour guide. In day one enjoy a tour to one of the Seven Wonders of the World “Giza Pyramids complex” and the Egyptian Museum, then catch your flight to Luxor for overnight. Next day, enjoy visiting Luxor landmarks such as Karnak temple, Queen Hatshepsut temple, and Valley of the Kings, then we drive you back to your hotel in Hurghada. Book Now! Internal flight ticket (Hurghada/Cairo – Cairo/Luxor). Private Egyptologsit tour guide throughout your tours. Entrance fees to all the sights in Cairo and Luxor. 2 Lunch during your tours. One night accommodation in Luxor at 5* hotel with breakfast. This massive belongs to King Chephren, it is the largest statue in the world, standing 73 m. long, 19 m. wide, and 20 m in height. It is the oldest known monumental sculpture. In the evening you will be driven to Cairo airport for flight to Luxor, upon arrival at Luxor airport, meet “Egypt Tours Portal” representative & transfer to 5* hotel for overnight. Valley of the Kings is the final resting place of Egypt’s rulers from the 18th to the 20th dynasty, it is home to tombs including the great pharaoh King Ramses II and boy pharaoh Tutankhamen. The tombs were well stocked with all the material goods a ruler might need in the next world. Most of the decoration inside the tombs still well preserved. Finally, we will transfer you by a private air-conditioned vehicle to your hotel to end your two days trips to Cairo and Luxor from Hurghada. Our first time visiting Egypt and what an amazing country! We were staying at the Baron Palace Sahl Hasheesh (see my review if interested on their page). As the tour was somewhat a dream for us both we wanted to ensure we used the right company and after looking around and seeing the reviews on TripAdvisor i took to Egypt Tours Portal and booked with them. We booked the 2 day Tour to Cairo and Luxor. There was Private transfers to and from our hotel, flights included and tour guides in both cities. From the moment we left the hotel (apart from during the flight) we constantly had someone taking care of us. We felt important and safe in a city we knew nothing about which i feel is imperative. I have to say the Pyramids in Giza have to be the highlight of our trip. Don’t let anyone tell you they are underwhelming, because they are really not and the culture and history is amazing too. Our tour guide in Cairo called Emy was absolutely incredible. She was so well educated and clearly passionate about her role. I honestly feel that she was a crucial part of our experience. Such an amazing Tour guide!! As well this she was great company and her photo skills were brilliant! In Cairo we were shown the Pyramids of Giza, The Sphinx and the Egyptian Museum. Luxor is so much different to Cairo, beautiful and traditional in comparison to the busy hustle and bustle in Cairo. The history they have there is incredible too. We visited Hatshepsut Temple, went on a Cruise of the Nile, The Valley of the Kings and Karnak Temple. All absolutley incredible. Our tour guide Mari-anne was lovely – Full of energy, knowledge and care. You can tell she has a caring nature just by how attentive she was with offering us drinks and asking how we are throughout the day. 2 amazing cities, incredibly history, beautiful sites, 2 amazing tour guides and an experience of a life time. Thank you EgyptTour Portal for organising and executing this woth such perfection. I would be happy to recommemd this company and answer any questions if anyone has any reservations. We book a trip in Cairo, Luxor and cruise for Nile river everything we know are fantastic the all the guides Nacho, Mohamed are amazing we really know this ancient culture i really appreciate how they take care us. After having just returned home from Egypt, I can safely say that my private tour to Cairo and Luxor was the highlight of my holiday! On the Cairo tour, our guide Mohamed Elshemei was fantastic. He was incredibly friendly and knowledgable, and took the time to explain everything to us in great detail. Nothing we asked for was too much – he showed us some fantastic places for photos and even took some amazing photos of me and my friend too! Mohamed was the perfect tour guide and our driver Abd Elnasser was also fantastic and did everything to make sure our journey was comfortable. He also waited with us to make sure we got on the right coach to Luxor which was a lovely gesture as we had not visited Egypt before! In Cairo my highlight was definitely visiting the Giza Pyramids – you can’t miss out on this experience, it’s a must see! In Luxor, the sights were incredible and our experience made all the more impressive by our guide Mohammed, who knew so much about Luxor! Valley of the Kings was my favourite part of this day, Hatshepsut’s Temple was also very impressive. We ate at an African restaurant where the food was amazing, and topped off the visit with a trip on the Nile! For those worried about their safety in Egypt please don’t be! We have just come back from the 2 day Luxor and Cairo trip and felt safe at all times. We did Luxor first with our guide Mohamed and driver Hussain. Very hot but an incredible day. Would recommend paying the extra to see Tutankhamen’s tomb – amazing! Had a lovely stay in a great hotel before flying to Cairo the next morning where we met our guide Mohamed and driver Ahmed. Cairo is crazy for traffic but felt very safe and Mohamed did a brilliant job tailoring the day to our needs. A slight hiccup with the driver from hurghada back to our hotel but it was all resolved quickly and with sincere apology. We would not hesitate to recommend this company and encourage you to get in touch with them if you are thinking of booking a trip here in Egypt. Very knowledgeable about Egypt and it’s most prized posessions (Pyramids of Giza and more!) and history.We felt at home and safe! HIGHLY HIGHLY HIGHLY recommend! I highly recommend Galal and this tour. They pick us up from our hotel in Hurghada The driver was very polite and our way to Luxor was very smooth. In Luxor, we met Galal. Galal is a fantastic tour guide, with a lot of knowledge and patient. He recommended us a lot of places and also give us time for ourselves to take pictures during the tour. The driver in Luxor was also great. The food in this tour was very nice and very authentic. Everything was perfect with Galal and Egypt tours portal! I highly recommend them! My wife and I had a great time in Luxor & Cairo. Our guides were very knowledgeable and professional. I cannot say enough good things about our in Luxor & Cairo. A big shout out to our guide in Cairo Mohamed! Mohamed exceeded all expectations with his warmth, charm compassion, knowledge etc. We will definitely use Egypt Tours Portal in the future & highly recommend them to anyone who wants to truly to experience Egypt. Private 2 day tour to Luxor and Cairo. Thank you so much for organising a wonderful trip to Luxor and Cairo. I must say my favourite place was the Valley of the Kings, The Egyptian museum is a must to see, pay the extra to go and see the mummies, its deffinatly worth it. Wish I could have spent more time in the Karnak Temples but it was just too hot for me. I must say a special Thank you to Mahmoved who drove us to Luxor, he was amazing and a special Thank you to Mohamed Hassan who has a wealth of knowledge and such a wonderful guide. You both made our trip extra special. Many Thanks. This is a temporary review until we finish our tour. Just at the end of day one from hurghada to Cairo. Friendly guide (mohamed) and driver. Very knowledgeable and just the right amount of information. We visited the pyramids and sphinx firstly. Then to an oil shop and papyrus factory. A wonderful lunch then on to the amazing museum. I will update this review once we finish in luxor. Tour Guide – Ibrahim, very knowledgable,well spoken and professional guide. Extremely informative about every location and touched on important details. Questions were always answered. Excellent! Cairo tour Bus – Ali, clean, comfortable and well kept bus. Great tour, with very friendly guide Ayman. He is very knowledgable about the places in Luxor and offers fantastic insights on souvenirs. We family of 4 (2 adults, 2 kids – 12 & 7 years old) took a private 2-day trip to Luxor & Cairo. Got an early morning pick up at 6 am from our resort in Hurghada in a private van, reached Luxor in 4 hrs. The drive through the desert was beautiful. Our guide Hagar was waiting for us at Luxor. She is an amazing guide, intelligent and so well informed and very fluent in English. All tickets were included (Valley of the kings, Hatshepsut temple, Memnon Colossi and finally Karnak temple) just had to pay extra for the Tutankhamun tomb (had to see it!). Had a nice lunch, they even arranged for some great falafel as part of the lunch (while it was not on menu). Stayed overnight at the 5-star Steigenberger hotel with 2 connected rooms for our family (included with breakfast). Hotel was on the Nile, quite centrally located. Had a morning flight at 8.10 am to Cairo (thanks for getting us business class, pleasant surprise!). We had Ibrahim our guide there pick us up from the airport with a private van. Very friendly and so well informed, walked us thru the cultural lifestyle of modern day Cairo residents as well as the millenniums old reign of dynasties! Started the day with the Egyptian museum, post lunch visited the Pyramids & Sphinx and ending the evening at Al Khalili market. All tickets included, except for the odd ticket for the camera or going inside the great pyramid (300 EGP per Adult). Ibrahim was like a friend and guide through it all, was with us from 9 in the morning to 9.30 in the night. He took some fantastic pictures of us at the pyramids. Thanks again, much appreciated! Got our flight at 22.40 back to Hurghada and there was our taxi waiting for us to drop us back to our resort. A wonderful 2 days organised by Egyptian tours. Have to be honest, we were anxious about having to do this trip alone (with kids) purely on online reviews in Tripadvisor, more established European tour operators were warning us against local operators but online reviews from other travellers on such forums do matter -gave us the confidence to go ahead and book. We lucked out with Egypt tours, a bit cheaper as well but more importantly lot more flexible to your needs! They don’t even charge you (except for the 100 EUR deposit) until you actually finish the trip – which is a bit unnerving in the beginning as everything is on emails only but when we saw our flight bookings we were reassured. Never seen that anywhere, Egypttours just raised the bar for me on expectations from a private tour! We are 2 friends who visited Egypt for the first time, staying in Hurghada, we both wanted to see the Pyramids and Valley of the Kings so this trip was just perfect for us. We were picked up from our hotel promptly at 4.15am and taken to Hurghada Airport where we caught our flight to Cairo. At Cairo we were met by our guide Amany, she was very friendly and even took us to a local place for breakfast before our tour started. First we went to the Pyramids, Amany’s knowledge was very impressive and we got so much more from our visit by having her with us, she also arranged for us to have a camel ride which lasted for approx 40 mins – this was just incredible and we couldn’t have wished for a better way to see the pyramids and scenery. The camel ride took us to the Sphinx where Amany was waiting for us – having our own private transport was so great and meant we could do so much more. After some time at the Sphinx, again with the very valuable knowledge of Amany, we were taken to The Perfume Factory in Cairo – where we were given a demonstration of the perfume making process and allowed to test the oils, they smelt amazing and we did buy some, but please be warned the oils you buy are not the same and very diluted, there are some very bad reviews on here about The Perfume Factory and had we known we would never have purchased, it is such a shame as Amany was absolutely great and I think Egyptian Tours should drop this from their itinerary for the sake of their reputation. We had a delicious lunch on a boat on the river Nile and then Amany took us to the Egyptian Museum where we saw all the treasures of Toutankhamon, mummies, tombs and various jewels and artifacts – again Amany knowledge was amazing and made this visit so meaningful. After this we visited a Papyrus shop – where we were given demonstration on how the paper is made, this was very interesting and we purchased some lovely pictures of Egyptian gods. We were taken back to the airport that evening where we took our flight to Luxor. This was a fantastic day, thanks to Amany and her driver, ideally we would have liked more sightseeing and less visiting tourist ‘craft’ shops. However this whole experience would not have been possible without Amany’s assistance. We arrived quite late in Luxor and were met at the airport by our second guide Abdelrahman, he took us to our hotel and made arrangments to pick us up the next morning. We were lucky enough to be staying in the 5* Steinberger Hotel where we enjoyed a lovely evening meal. The next morning Abdelrahman (Abdel) picked us up from the hotel and we started our day with a boat ride across the Nile in a traditional Felucca, this was a fantastic experience and a great way to start the day. Adbel was very friendly and informed us of the plans for the day, which thankfully involved much less souvenir shopping. Our driver was waiting for us on the other side of the Nile and took us to Valley of the Kings where we were able to enter the three main tombs, Abdel was very knowledgeable about them but had to wait outside as guides are not allowed in, we then went to his local village where we saw stone carving and even had a go ourselves. Next we went to Hatshepsut Temple – which was quite incredible, this was followed by a visit to Al Aqaleta – Al- Boaairat Temple which has some amazing wall carvings. We stopped for lunch in a roof top restaurant and enjoyed traditional food with Abdel before heading back to the Felucca to cross the Nile. Abdel was very accommodating to fact that we didn’t want to visit tourist shops and arranged an extra activity for us – this was a ride on a horse & cart through the streets of Luxor – what a brilliant experience it was – well done Abdel. Finally we visited the Karnak Temple which is a mass of carved stone columns – Abdel’s knowledge was just brilliant and made the whole day very enjoyable. We were then transferred back to our hotel in Hurghada by the very friendly driver. All in all this was a fantastic 2 days and worth every penny – we both got so much more than if we had tried to do it alone. Both Amany and Abdel were such brilliant guides and a real asset to Egyptian Portals, the driver also deserves a mention as he was always in the right place at the right time and friendly. An amazing experience. I found Egypt Tours Portal on trip advisor and booked with them. We started off in Cairo, then flew to Luxor, then drove to Hurghada and flew back to Cairo. Overall it was an excellent trip. Our tour guide in Cairo was FANTASTIC. Her name is Reham! She took care of us and is very knowledgable. Our tour guide in Luxor was also AMAZING. His name is Ayman and he is very well informed as well. I would recommend asking for Reham and Ayman if you do decide to visit Cairo and Luxor. Also, our driver in Cairo, his name is Badr, he was very friendly and made us feel very comfortable. Our experience in Hurghada was also great. We went with Alex Safari for a Quad Bike Session and it was an excellent experience. 1. I would not recommend staying at the Cairo Pyramids Hotel in Giza. They are super unhelpful and unorganized. We stayed there for two nights. Our first night was a disaster. We were woken up by excessive smoke in our room at around 2am due to the heater in the room. The maintenance man did not speak english and kept insisting that we were smoking in the room. After about 40 mins of his nonsense, we called the front desk again and asked to switch rooms. The manager and the customer service person did not sound apologetic and were very cocky! The manager said he is aware that the heater is faulty and it has happened before. The entire room was filled with smoke due to their faulty heater and all he said was “Yes, we know. It has happened before”. That was ridiculous. The entire room filled up with smoke and that is a SERIOUS HEALTH ISSUE but they seemed unbothered. 2. Always bargaining 50% off and lower. Everyone is out to get you. Do not get excited. Be patient and you will find what you are looking for at a cheaper price elsewhere. 3. We did a horse ride in Luxor with this guy called Ali. He was great from what it initially seemed. He offered to buy my friend Black Tea (overcharged for it) and then also treated us to Sugar Cane juice and peanuts. As the ride went on, we got super cold and asked him if he could stop somewhere so we could buy a shawl. He brought someone to the horse carriage and the person asked for $18USD per shawl. Ali did not say anything despite us repeatedly asking him if this was a good deal. In the end we realized, we over paid for the shawl by $14USD. They were selling the same shawls in the bazaar for much cheaper. Besides the small hiccups, we had a great time with Reham and Ayman. Would highly recommend requesting for them when you are in Cairo and Luxor. Also Egypt Tours Portal took care of everything. They made sure we got what was in the itinerary! I would highly recommend booking with them. Well done to all at Hurghada tours , Special thanks to our tour guides Reham who we spent a great day with in Cairo and Mohammad who took us around Luxor. As a wheelchair user I was nervous to take the trip but these guys went well beyond going the extra mile . Helping me to get around the sites.Without their help I would not have been able to see so much. They both were so knowledgeable and friendly, The whole tour was very well organised from start to finish . I now have special memories of a wonderful trip, I would highly recommend this company and tour, to anyone thinking of visiting Cairo and Luxor. During our stay in Hurghada, we had 2 single-day tours: one to Cairo and the pyramids, and one to Luxor and the Karnak temple. Both were truly amazing, our guides were very nice, interesting and helpful, we learned a lot and enjoyed the discovery of Egypt historical sights. Highly recommend! Had the most amazing couple of days being guided around Luxor and Cairo. Fantastically simple way to see fantastic sights in Egypt. Everything was organised for us and our tour guides Hitham and Ibrahim both took great care of us in Luxor and Cairo. Thank you to both of you!!! I would totally recommend this tour to anyone who wants 2 full packed days of amazing sights and learning about Ancient Egypt. Our guide in Cairo taught us SO much fascinating new stuff and we just had an amazing time!! When I first booked this trip, I had a search round the internet and settled on Egypt Tours or Tours From Hurghada. I was a little un-easy about giving a £100 deposit via Western Union, as it is often used by criminals & ne’er-do-wells, however I couldn’t have been more distant from the truth. We were collected from our Hotel in Hurghada, by private taxi and driven to the airport. We were then dropped of at Cairo Airport, I didn’t know but I had left my sunglasses in the taxi, but no problems Abraham had me paged and we met at security, top service indeed. The flight to Luxor was an experience, but nothing what so ever to do with Tours from Hurghada, we were delayed over 6 hours because the President of Egypt was on a visit to Luxor and they closed the airport, however our guide Mohammed dutifully waited at the airport till 2:00am, top guy. We awoke the next morning to see the Egyptian Air Force showing of it latest hardware for The Chinese Presidents visit. There was an un-expected benefit of all the delays however, we followed the Presidential party around to all the tourist sites, and they were all empty, no hawkers or peddlers bothering you. Anyway after our day in Luxor it was back to Hurghada by private taxi. If you want a whistle stop tour of Cairo & Luxor, I can think of now better way to do it and no better company to do it with 10/10. Prior to our trip to Hurghada, we investigated different trips we could book in advance to ensure that we got the trip we wanted to see a lot of the cultural and historical sites of Egypt. We wanted to go to Luxor and we wanted to go to Cairo for the Pyramids. We looked around and decided to go with Egypt Tours Portal because of their existing good reviews, and did not regret it for a moment – so we’re adding another glowing review to their list. We knew we wanted to see the Valley of the Kings and Karnak in Luxor and we knew that we wanted to go see the Pyramids at Giza, but this company then customised a tour around this, tailored to us and totally private, not needing to get on busy buses full of other tourists and with our own personal guides and drivers to take us from destination to destination. On the morning of the trip, our driver Mohammed picked us up bright and early and we started the lengthy drive from Hurghada to Luxor. If you are going to do this, I advise sleeping for a while if you can, as it’s mostly a drive through the desert. We were also offered the chance to take a break half way through, which we declined – but I advise taking this as there is nowhere else to be stopping to take a comfort break and stretch your legs. We met our guide, who said to call him “Sam” and we set to exploring the delights of Luxor. We went to the Valley of the Kings and explored a few of the tombs there. It’s amazing how the murals on the wall have kept their colours over the years and how civilisation from so long ago could construct such majestic tombs. They’re all virtually empty, with the contents of them having been removed and taken to the Egyptian Museum in Cairo or have been appropriated by other countries around the world for their own museums. Next we explored the Hatshepsut Temple, which was a multi storied monster of a complex, which was incredibly well preserved. We moved on to the Colossi of Memnon which were astoundingly tall constructs in great condition. We then had a a private trip down the river Nile which was stunning, until we reached the secluded island location for some lunch which was delightful. There was a small zoo which is not something we agree with but other than the place and staff were warm and welcoming and we had great views of the Nile and the city. Then we went to Karnak. And just wow. This place is stunning, with seemingly endless amounts of columns, pillars, walls and obelisks. It’s hard to put into words quite how impressive Karnak is – you simply have to go there and experience it. Throughout Sam gave us insight into the history of the sites we were visiting and was great fun. He was very knowledgeable, and had answers to all of our questions. A great guy and a cracking guide. We checked in to our hotel and got some well needed rest after a busy day exploring and after a lovely meal, were asleep before too long, getting ourselves ready to get up before dawn to catch a flight to Cairo for day two of our adventure. Upon arrival in Cairo we were met by Abraham, our next guide and went straight to the Egyptian Museum. Abraham was again, much like Sam, full of knowledge and clearly loves his profession, telling us tales of the various artefacts that could be found in the museum. By all accounts the new one that they are building will be considerably larger and contain even more treasures from Egypt’s astounding past. There was so much to take in here, it was a struggle to keep it in our brains, but Abraham was asking us lots of questions about things as we went through (and liked the fact that we could guess answers based on the clues we’d been given as we were going around or from our own general knowledge) which helped cement these learnings. 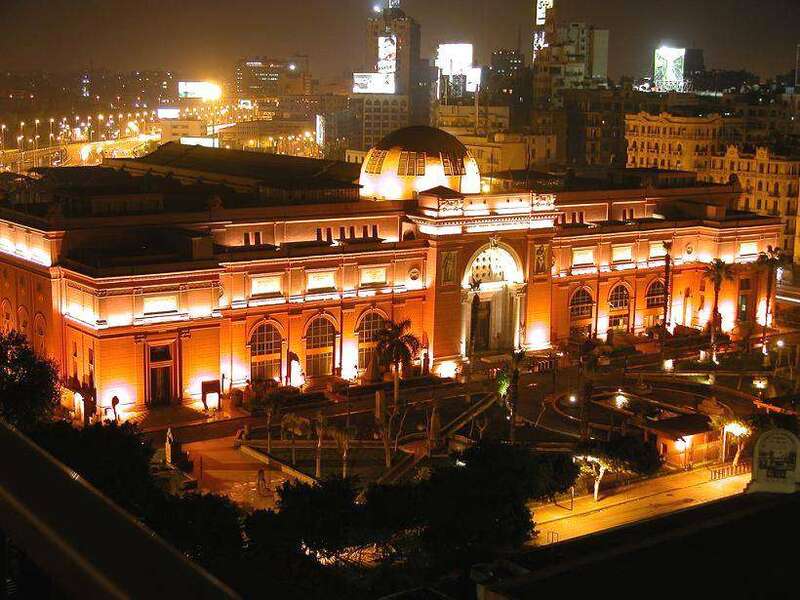 We also didn’t realise until we got there that the Egyptian Museum is in Tahrir Square, where the Arab Spring begun something of great interest to my partner and Abraham was also happy to share his experiences of this more modern history. After a spot of lunch, we moved on to Giza and explored the Pyramids and the Sphinx, which was undoubtedly the highlight of a highlight packed tour. We got to go in one of the smaller Pyramids and see the insides of these constructs, which was stunning, but the Pyramids were everything we’d hoped and more. And not at the end of a busy high street opposite a McDonald’s as some say. They were absolutely fantastic constructions and its a real shame the smaller granite covered one was never properly finished and fully clad, as that really would have been a stunning differentiator for that one. They’re simply huge and for all that Stonehenge is an astounding feat of ancient engineering that us Brits are accustomed to driving past, seeing all of the constructions from Egypt from the same time period and even earlier, it’s stunning to think how advanced these engineers were for their time. Quite how they used mud “walkways” to build such tall, such intricate buildings, is truly astounding. We were understandably a little concerned travelling to Cairo as we thought there was still a certain level of unrest. But we felt 100 per sent safe and welcomed the entire trip. The guides were great at assuring we didn’t get hassled too much and told us how much we should be paying for anything we wanted to buy. It was the trip of a lifetime and I would wholeheartedly recommend anyone visiting Egypt to take a trip of a similar nature using this provider – everything was absolutely spot on. This was the first visit to Hurghada for my wife and me and we planned to visit the pyramids for my wife’s birthday. After reading lots of reviews we decided to book a 2 day Cairo/Luxor trip with Egypt Portal Tours. The booking process was simple with Ahmad Sameer answering any queries by email very quickly. Pickup from our Hotel to the airport was on time. On arrival at Cairo we met Abraham, our guide for the day, not knowing what a wonderful day it was going to be. Abraham made us feel extremely welcome from the moment we met and by the end of the day it felt as if we had known each other for years. We climbed in the van and set off for the museum. After a few minutes we stopped and Abraham disappeared for a couple of minutes then re-appeared with a red rose for my wife’s birthday! It was a kind and wonderful gesture and would be the first of many surprises that day. The museum visit was fascinating and Abraham’s knowledge was amazing. We totally lost track of time and after more than 3 hours he had to drag us away otherwise we would have spent all day in there!! We all 3 of us had a sail on the Nile in a private Felucca which Abraham had arranged before driving to the Pyramids for lunch. We had a wonderful view of the Pyramids as we ate lunch – my wife couldn’t believe that we were actually there on her birthday. After lunch we drove up to the pyramids and while we were taking photos Abraham called us back to the car and opened the back. Inside was a huge birthday cake for my wife. He had phoned another of the guides and when he arrived they and the drivers all sang Happy Birthday. My wife couldn’t believe it. Not only had she seen the Pyramids on her birthday but now she was eating her birthday cake there as well!! Surely the day couldn’t get any better…. After lots of walking and taking photos we sadly left the pyramids for the Papyrus Institute where Abraham presented my wife with a papyrus with her name and birth sign – another surprise! Finally we left for the airport where we all hugged and sadly said our goodbyes to Abraham (and the driver Ibrahim). On arrival at Luxor we were met by Sam our guide for the next day who took us to the Sonesta St. George hotel for our overnight stay. The room had a balcony overlooking the Nile and we finished the night having a drink looking out at the Nile. It was a perfect end to a perfect day which will stay in our memories for the rest of our lives. Sam picked us up at 8:30 for the start of another wonderful day. We visited the Valley of the Kings (including King Tut’s Tomb), Hatshepsut Temple, Colossi of Memni and Karnak Temple. The best part for us was the Valley of the Kings. The hieroglyphics and paintings in the tombs are unbelievable but be warned that taking photographs in the tombs is not allowed. We also had a ride in a motorboat and lunch in a restaurant overlooking the Nile. Sam was a very knowledgeable guide and told us lots of facts relating to the places we visited and explained the meanings of the hieroglyphics and what they represented. Unfortunately, by the end of the 2nd day our brains had been overloaded but we bought a book about the tombs so can now read more about them at our leisure. We left Luxor at about 4:00pm and arrived back in Hurghada 4 hours later very tired but very, very happy!! A big thanks to Ahmad from Egypt Portal Tours for organising the perfect trip for us and we couldn’t have asked for more. He rang several times during the trip to make sure that we were OK and that there were no problems. Also thanks to Sam our guide in Luxor and his driver and a huge thanks to Abraham our guide in Cairo for making my wife’s birthday so memorable and the driver Ibrahim for negotiating the Cairo traffic safely! The little surprises provided in Cairo were the icing on the cake so to speak. I would definitely recommend Egypt Portal Tours for a truly professional service and value for money. They really are excellent. Just got back after a great trip to Egypt and the tour organised by ETP was its jewel! We booked the 2 day trip by plane from Hurghada to Cairo and Luxor. Visited in this order: Egyptian Museum, lunch at the Nile river, Pyramids, papyrus factory, Khan el Khalili bazaar. I would not go to praise the objectives that we visited, maybe a couple of personal impressions. Our guide, Mr. Abraham was a knowledgeable, well informed and open minded man. He even helped us negotiate prices and made his best to ensure us everything we needed. Even took us to a coffee at McDonalds and dinner at KFC, and before departure, since we had time took us to a mall in the proximity of the airport. Later we flew to Luxor where we were greeted by Sam. We staid at a Hotel(Sonesta St. George) way better than the one we were on our vacation. Sam is also a History book, he took us to the Valley of the Kings, temple of Hatshepsut, lunch at the Nile river(food was great by the way), and later in the afternoon to the temples of Karnak. Maybe one note, he should stick a bit closer to his tourists since the touts are quite aggressive. Altogether we had great support from Mr Sameer who even called us after each tour to make sure everything was OK and the tour was great. My advice to anyone who has doubts is to go to Egypt. It may have its share of poverty and mainly on the internet you will hear that it is bad and dangerous, we never felt threats, just try to be open minded and you may have the experience of a lifetime. Piece of advice: book with a good and reliable agency(ETP) since it will make the experience complete for you!